This happens every day across Cuba. 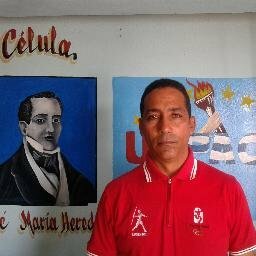 14ymedio, Havana, 29 January 2016 — The houses of Alexeis Martínez and Carlos Oliva Rivery, both members of the Patriotic Union of Cuba (UNPACU), were raided by police this morning, according to the opposition organization. The two houses, located in the Mariana de la Torre neighborhood in Santiago de Cuba, were searched just after six o’clock in the morning by uniformed personnel and the two activists were taken to the second unit of the PNR (People’s Revolutionary Police) in Santiago de Cuba. Some witnesses commented to 14ymedio that participating in the operation were Special Troops of the Ministry of Interior along with the police. The 20 uniformed personnel presented a search warrant, but failed to summon two witnesses from the Committee for the Defense of the Revolution to be present during the search, as required by regulations, and instead took advantage of two “unknown passersby” to play that role. According Alianne Pérez, the wife of Alexeis Martínez, at the conclusion of what she considered “an assault,” a computer, several disks and documents, two mobile phones, all the food in the house and two paintings hanging on the wall were seized. In Oliva’s house, the dining room serves the organization’s members from other places who pass through the city to take courses, as well as other activists who work full time for UNPACU. Between last 22 November and today, the organization has already reported 15 raids. In an interview posted on YouTube, and just days after his release, former Cuban political prisoner Hugo Damien Prieto vows to continue as part of the struggle for freedom in Cuba, "until the end of the Castros." He also thanked those on the island and overseas who expressed their solidarity with him during his three months in prison. Prieto Blanco and Wilberto Parada Milan, who also was released on Jan. 20, were arrested Oct. 24, two days after they led a protest to demand the release of three activists arrested in September when they approached Pope Francis before he celebrated Mass in Havana. Prieto Blanco is head of the leader of the Orlando Zapata Tamayo Front for Civic Action. "Economic reform" in Cuba doesn't mean anything if it doesn't allow the people to eat what they want. When Cuban police raided food vendors doing business free of the normal controls, the people wanting and needing food pushed back. The raid against street-cart vendors selling fruits and vegetables launched in Havana last week by the government is causing unease among large sectors of the population. Most affected by the restrictions are those who find in this commercial alternative a chance to buy food in their own neighborhoods and streets, far from agricultural markets. For the elderly, people with disabilities or families with small children, the ability to buy fruits and vegetables “on their doorstep” has been very popular in recent years, despite high prices. In a clear strategy of “cutting off their nose to spite their face,” the authorities have decided to combat high food prices through maximum restrictions on intermediaries and street vendors. 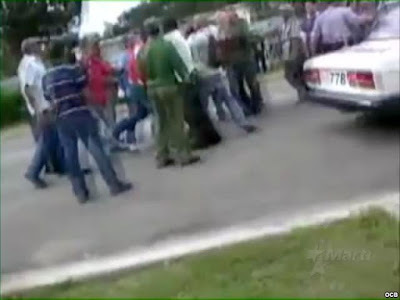 The scene of a group of people protesting when police demand to see his papers and confiscate the merchandise from a street-cart vendor, as shown in this video that has come into our hands, says a lot about the unpopular measures of control the government has adopted against private vendors; and it also highlights the shortages of food products Cuban society is suffering today. In the images posted on YouTube under the pseudonym SomosdeCuba (We are Cuban), the police harass street vendors selling fresh food. People start to gather and shout: “Abusers,” and then in a chorus yell “Food! Food! Food!” Finally the vendors start giving away their products rather than let the police confiscate them. More than a year after the United States and Cuba normalized relations, with promises from President Barack Obama that American appeasement would bring democratic change and respect for human rights to the island, how are the Castros doing? Read the whole report on Cuba here. Figueroa was a part of the group of 53 political prisoners released in January 2015 after negotiations between Washington and Havana, according to a report at the time from Elizardo Sanchez, head of the Cuban Commission for Human Rights and National Reconciliation (CCDHRN). The opponents were charged with disorderly conduct and sent to prison pending trial. The first has been held in Valle Grande and the second in the Combinado del Este in Havana. After his release, Hugo Damian Prieto and his wife visited the headquarters of the Ladies in White in Havana’s Lawton neighborhood, according to former prisoner of the Black Spring, Angel Moya. With many in the U.S. Congress eager to do business with the gangsters in Havana, it is worth recognizing those of their colleagues who recognize the nature of the Castro regime and its bad behavior, and refuse to change their approach until the dictatorship changes its approach to the Cuban people. Congressman Mario Diaz-Balart (R-FL) released the following statement calling for the immediate release of independent journalist Misael Canet Velázquez. “On December 17, 2015, independent journalist Misael Canet Velázquez of the Orlando Zapata Tamayo Civic Resistance Front was violently arrested and imprisoned for expressing his desire for freedom. According to reports, he has been on hunger strike for at least 27 days and, according to his family, is being held in abhorrent conditions in Camaguey’s notorious Kilo 8 prison without clothes or a suitable place to sleep, and has been provided limited access to water. There were reports overnight that Hugo Damien Prieto has been released. Rep. Diaz-Balart last week also wrote a letter to President Barack Obama about Jorge Ramirez Calderon and other political prisoners in the Castro gulag. "I respectfully request that you demand that Cuba's prisons be forever emptied of all innocent men and women, and that it begin to adhere to the most basic standards of decency and human rights," Diaz-Balart wrote. Despite promises from Washington that normalized relations with Havana would bring change to Cuba, the level of political repression -- in any realistic assessment, the only way to gauge the success of the Obama policy -- is as bad in 2016 as it was in 2015, after the new arrangement went into effect. This past weekend, over 300 Cuban dissidents were arrested for peacefully demanding the release of all political prisoners and their fundamental rights. Among those arrested were 50 members of the renowned pro-democracy group, The Ladies in White, in Havana. Various of them, including Yamile Garro and Aliuska Gomez, were cornered and violently beaten beforehand. In the eastern provinces, over 200 members of the Cuban Patriotic Union (UNPACU) were arrested. In Santiago de Cuba alone, there were 137 arrests. A major raid by Castro's secret police sought to stop a gathering for the third anniversary of the pro-democracy initiative, Proyecto Emilia. Among those arrested was its founder, Dr. Oscar Elias Biscet, a U.S. Presidential Medal of Freedom recipient, along with 24 other activists. Finally, there's great concern about the well-being of Cuban political prisoner, Jorge Ramirez Calderon, one of the 53 prisoners re-arrested after Castro reneged on his agreements with Obama. He's on the 23rd day of a hunger strike protesting his unjust imprisonment and has been transferred from a punishment cell in Manacas prison to an undisclosed location. More "change" you can't believe in. One of the Castro dictatorship's favorite repressive tactics is the "act of repudiation," in which the police or other communist thugs rally a mob -- often including students and the elderly -- to attack anyone who might oppose the regime, with jeers, threats, etc., in order to try to intimidate them. Some times, it gets really ugly and people get hurt. Here is an act of repudiation that happened recently in Havana, outside the home of a member of the Cuban Damas de Blanco, or "Ladies in White." Cuban political prisoner Vladimir Morera Bacallao's hunger strike was terminated Dec. 30 when doctors began feeding him intravenously after he slipped into an incoherent state after more than 80 days of not eating to demand his release. His wife said he is being fed "against his will." "If he had his mental faculties, he would not have ended the hunger strike," said Morera's wife, Maribel Herrera. "What happened is that he is completely disoriented." 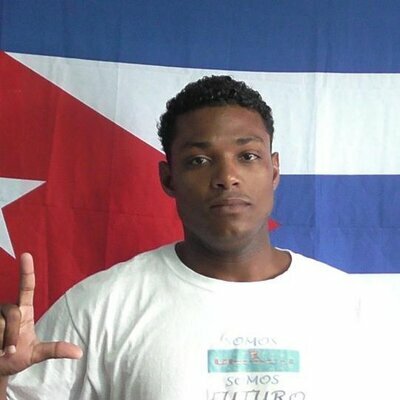 Morera, an activist with the Cuban Reflection Movement in November was sentenced to 4 years in prison on charges of "public disorder" and "injuries." The case stemmed from an incident in April when Morera painted a message on his door to protest local "elections" in Cuba: "I vote for my freedom, not in elections where I cannot elect my president." Cuban police and other goons responded by breaking into Morera's house and arrested, an intrusion for which Morera took all the blame. The circumstances were similar to an incident 2013, after which Morera was sentenced to 8 years in prison. At the time of his sentencing on Nov. 18, Morera had already been on hunger strike for 40 days, a protest he continued into Christmastime, at great risk to his life. The Castro regime has given no indication it will give Morera what he wants. But considering the attention his protest has attained, the dictatorship may not be willing to let him die. As measured by maybe the most important indicator -- the level of political repression -- President Barack Obama's opening to Cuba, which has been sold as a way to maybe, hopefully, eventually foster change on the island, has been an abject failure. The Cuban Commission on Human Rights and Reconciliation reported Monday there were at least 930 politically-motivated arrests of Cuban dissidents in December. It was the third-highest monthly tally of the year, and brought the count for 2015 to at least 8,616. That's only 273 fewer than in 2014 -- before Obama and dictator Raul Castro struck their deal to re-establish relations. The Castro regime has enjoyed many benefits from the new arrangement: More American tourists, more American politicians begging to make a deal, any deal with the dictatorship, etc. The Cuban people, who seem to be voting with their feet, not so much.